What exactly is the difference between all these massage techniques? How can they help with pain or stiffness? Which one is best for you? I see an increasing number of clients with muscular aches, pain, stiffness & lack of movement. 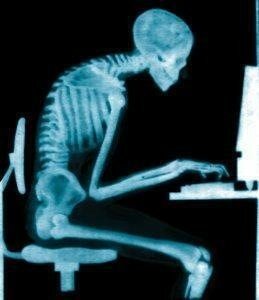 This can be due to many factors: lack of exercise; lack of general mobility due to illness or injury; over-exercise & not allowing muscles to properly relax; long working hours; desk-based work (causing the classic C-shaped hunching spine seen below); long hours of driving, travelling or commuting; stress, anxiety & emotionally-held tension, or simply a sedentary lifestyle. Whatever the cause there are many different massage techniques which I can offer to help you & I often choose to combine them. I have therefore decided to compile a series of small articles letting you know about each kind of massage technique & method I have trained in. The first of these will be about Deep Tissue Massage. As usual please click on anything highlighted in green, which will take you to a weblink. Deep Tissue Massage uses very deep pressures applied to muscles & fascia (the connective tissue which surrounds all the muscles & organs of the body) both of which are crucial for movement & good flexibility. Some massage therapists apply these quickly – but this can result in pain & tenderness (if you have ever experienced a painful massage treatment this will probably be why!). I therefore prefer to relax my clients first & create these deeper pressures very slowly & hold them for quite long periods – usually between 1-3 minutes per hold. I personally find that this also creates longer lasting muscle release than more painful short releases. This also means that Deep Tissue Massage requires more time & is more focussed than general methods like Swedish or Soft Tissue Massage. Deep Tissue Massage is a therapeutic technique designed to relieve severe tension & congestion in the deeper tissue structures of the muscles & the connective tissue or fascia that surround them. It is usually recommended for people who experience consistent pain & stiff muscles – due to heavy physical activity, clients who have sustained physical injury, or conversely those who have seized up due to a lack of or no physical activity. The method comprises many of the Swedish massage therapy movements, but the pressure applied is more intense & works to release chronic muscle tension or knots, known as adhesions. The techniques used can also stretch & lengthen the musculature to open out the body. Unlike other methods that are for pure relaxation, the deep tissue massage techniques are more intense, & apply slower, deeper pressure on the problem areas. They are known as ischaemic pressures – which comes from the word ‘ischaemia’ meaning restriction of blood supply, as the pressure temporarily restricts the blood flow to the area, gradually allowing the muscle contraction to release. When the pressure is released more blood flows into the area providing relief from aches & pain, improving mobility & allowing the muscle to move more freely. This is why clients often report that any pain or tenderness tends to reduce after the initial pressure, as the massage continues & with subsequent treatments. Causes – why do we get muscular aches, pain & stiffness? Musculoskeletal pain is usually due to a cycle of cause & effect within the body. It begins with a muscle being injured, over or under-used which causes the muscle to contract. This can lead to spasms in a specific part of a muscle. These spasms may spread further with time, especially if the cause continues – this is why stretching the muscle can be a very effective way to stop the problem before it begins. As a result of these spasms the blood circulation to the affected area is decreased & lactic acid builds up & cannot drain away properly through the lymphatic system. The restriction of blood circulation causes a lack of oxygen & nutrient supply – these are required for muscle movement & so the contraction can become worse as the muscle cannot lengthen. Whilst the build-up of the lactic acid is what causes muscle spasms & soreness – it is lactic acid build-up, for example, that causes cramp. Deep Tissue Massage processes use friction & compression of the muscles to first restrict then release, thus increasing the flow of blood & nutrients & draining lactic acid, which can allow the muscle to naturally relax. Hence, the techniques are very effective for pain relief, especially for chronic conditions & sports related injuries.